The San Antonio Spurs won one of the wilder games in the NBA this season, beating the Oklahoma City Thunder 154-147 on Thursday. 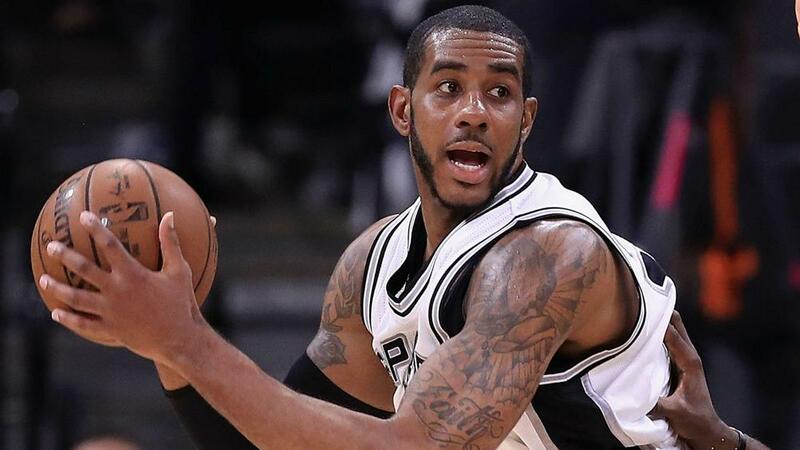 San Antonio took down Oklahoma City in double-overtime behind a career-high 56 points from LaMarcus Aldridge and an unprecedented three-point shooting display. The 56 points is the most scored by a player without a three-point attempt since Shaquille O'Neal tallied 61 in 2000. The Spurs were absolutely on fire from three-point range, as they went a perfect 10-for-10 from beyond the arc in the first half. San Antonio were the first team in the last 20 years to record that stat line in a half. It did not stop there, though. San Antonio made their first 14 three-point attempts. In total, they finished 16 of 19 from beyond the arc. But the Thunder did not back down as Russell Westbrook had a great game. He posted his fourth career 20-point, 20-assist performance in addition to a triple-double (24-13-24). Boston's Kyrie Irving scored 22 points while adding five rebounds and five assists in a 115-99 loss to the Heat. Nikola Jokic tallied his fifth triple-double of the season with 18 points, 14 rebounds and 10 assists in the Nuggets' 121-100 win over the Clippers. Kings center Willie Cauley-Stein had 14 points, 14 rebounds and five assists in Sacramento's 112-102 win over the Pistons. Al Horford went one-of-eight shooting and 0 for four from three-point range with two points on Thursday. Boston were minus-26 with him on the floor. DeMar DeRozan almost tallied a triple-double (16-11-8), but he missed a shot to win the game in regulation, again in the first overtime and committed a big foul in the final 12 seconds to give the Thunder a little hope. He also shot seven for 22 from the field. Heat forward James Johnson put Irving on a poster in Miami's win over Boston. Portland continue to impress this season while Charlotte are holding on to a playoff spot in the Eastern Conference. Kemba Walker and Damian Lillard are two of the most entertaining guards in the game, and CJ McCollum can go off in any game.